The Insurance Adjustment Bureau is proud to have recently been honored as a Jade Sponsor of Philadelphia Chinatown Development Corporation (PCDC). PCDC is a grassroots non-profit, community-based organization. Its mission is to preserve, protect and promote Chinatown as a viable ethnic residential and business community. 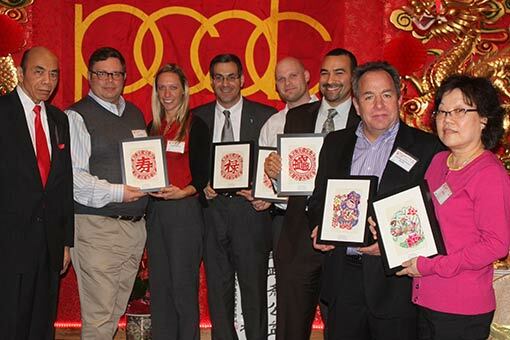 Seth M. Straff, IAB Corporate Secretary and Principal (pictured 2nd from right), graciously accepted the award on behalf of the IAB team when it was presented by PCDC Director Emeritus and Co-Founder, Anthony Wong, at the annual PCDC Chinese New Year Banquet. “We are extremely proud to support such a terrific community and we hope our continued sponsorship with help to further strengthen Chinatown,” commented IAB’s Seth Straff. For more information about PCDC, visit www.chinatown-pcdc.org.